Whatever your idea of a wedding may be, Tuscany is a region rich in natural, historical, artistic and culinary wonders, which always manages to make everyone agree and make the most important day of your life truly unforgettable. In case of acivil ceremony however, it may be more difficult to find the ideal location and create the right atmosphere. 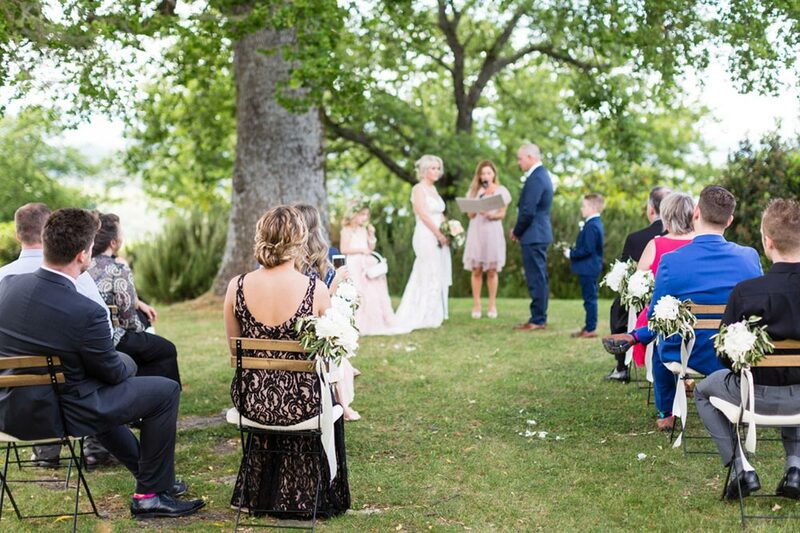 This is mainly because the civil ceremony has a shorter duration than the religious one, and usually, if you do not look for alternative solutions, it takes place in the bare and cold municipal halls, which certainly not able to inspire and provide the ideal setting for such a special event. However, every couple deserves their dream wedding! So, especially for civil ceremonies, the support of a wedding planner, who can help you find a location that suits your expectations and your desires, becomes very important. Imagine an expanse of vineyards, the soft contours of the hills on the horizon, a good glass of wine and maybe a refreshing swim in the pool. Or think of a beach entirely to yourself, the sound of the sea waves that cradles you, the sun that shines and warms you. Or, imagine yourself in a magnificent villa, with all your friends and relatives, a short distance from Florence or Siena to enjoy a day of celebration. Wouldn’t it be great if it was your own wedding? Open your eyes and stop dreaming, because such beauty can become reality, if you are thinking of organizing yours civil wedding in Tuscany. The good news is that, in addition to the regular municipal rooms, the Italian state has made available to those who want to marry civilly different locations on the territory where you can legally perform the ceremony. And no, they are not anonymous and grey rooms, but real villas, castles, beaches or gardens where you can say “yes” to each other, surrounded by the people you love, in a dreamlike location. The ceremony in these locations will be unforgettable, for you and for all the guests, not to mention the photos, which with such landscapes and details will speak for themselves. Also, in most cases you won’t have any difficulty in finding a solution for your overnight stay or for that of the guests, and depending on the location chosen, you will be a few miles from the most beautiful cities of Tuscany, some of the most beautiful villages or the most fascinating countryside. A dream for you and for all your guests, right? As we have already mentioned, the best solution to find the perfect location for your civil wedding is to contact a professional in the field. But in the meantime, reading the next few lines, you can already have an idea! One of the most famous and popular, to give a specific example, is the Villa La Ferdinanda of Artimino, better known also as the Villa Dei Cento Camini (Villa of the Hundred Chimneys). It is located precisely in Artimino, on the hills of Prato, and it is a very large villa, where you can live the whole day, from the ceremony to the reception, during all seasons of the year. The space is not lacking, both inside and outside, but especially in summer or spring the wedding can be celebrated in the garden of the villa, with a beautiful view of the surrounding landscape. The green space is also large enough to take beautiful photos, in any case, from here in about 30 minutes by car you can also reach Florence. In this property it is possible to stay overnight, both for the bride and groom and for the guests, and it is an excellent starting point to visit different places in Tuscany. If your dream has always been to get married in Florence instead, in the heart of the city and the beautiful Tuscany, for your civil wedding you can choose the Red Hall of the municipality, inside the majestic Palazzo Vecchio. Here you will be simply surrounded by some of the most famous works of art and architecture in the world: Piazza della Signoria with a copy of the David, the Uffizi, Ponte Vecchio, the Duomo and Giotto’s Bell Tower, all this heritage is just a few steps from the hall and may become the backdrop of your wedding album. Splendid, don’t you think? The Red Room itself can also boast a great beauty: your special moment will be framed by splendid damask velvets on the walls, beautiful paintings, and antique and prestigious furnishings. The only thing to be noted: the ceremony here is often very fast, keep it in mind when making your choice. From the hall you can move for the reception to some of the luxurious hotels in the city, or go to a villa or farmhouse just outside the city centre if you have chosen something surrounded by greenery. Another very beautiful city for a civil wedding in the heart of Tuscany is Lucca: smaller and less chaotic than Florence, it is a real jewel of art, architecture and history. Here the civil ceremony can be carried out within Palazzo Orsetti, seat of the Municipality of Lucca. This is a palace dating back to the 500 that houses inside the so-called Saletta Verde (Green Room), the one chosen for weddings with a civil ceremony. This building is truly majestic and regal, and also has a garden where the bride and groom can take pictures with their loved ones, after the ceremony. Let’s move to Pisa, where from May to October, civil marriages can be celebrated within the Giardino Scotto (Scotto Garden), a nineteenth-century green space that has recently been refurbished to become the location of beautiful outdoor ceremonies in the warmer months. In this garden it is also possible to have a refreshments reception, immediately after the wedding, together with all your guests. It does not end here: another really very popular city that we recommend for your civil wedding in Tuscany is Volterra. Its location is great, ideal for reaching Siena, Florence and Pisa, the views in this area are breath-taking and the ceremony can be held in a beautiful room, that of the Great Council of Palazzo Priori. A frescoed room, with beautiful vaults, large enough to accommodate about a hundred guests and right on top of the famous village. As soon as you get out you can take beautiful photos in the streets of Volterra, and for the reception, choose one of the many farmhouses or country houses in the area. Do you prefer the sea to villages, towns and the classic countryside? Don’t worry, Tuscany will also amaze you with its beaches! And here too you can celebrate your civil wedding. Yes, you understood correctly, by the sea, on a summer evening or a spring afternoon, with the sound of the waves and the breeze that accompany you on the most beautiful day of your life. And you can also rely on some bathing facilities to set up your wedding lunch or dinner. Wouldn’t that be wonderful? In short, even for civil weddings the perfect location exists: just choose your style and rely on professionals. The result will be an unforgettable day.